Mike Vaught, Vice President of Athletics, spent a busy morning at St. Mary’s Food Bank Alliance during the Annual Turkey Drive. Olga Karaway of Phoenix lost her job this year, amid a host of other setbacks. “It’s just tough,” she said as she waited in her car Monday to pick up the makings of a Thanksgiving feast from St. Mary’s Food Bank Alliance in Phoenix. “If it weren’t for this food, we’d probably be eating Braunschweiger (liverwurst) sandwiches,” she said. Joanna Lyons began weeping when asked about her family. 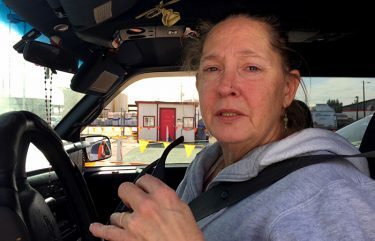 Her granddaughter recently became a crime victim, she said, and she and her husband drove from Michigan to offer support while charges are filed. Alice Humbert, whose wait was made more pleasant by the companionship of her Chihuahua, Daffy, said that without St. Mary’s Food Bank, there would be a very different meal on her Thanksgiving table. Joanna Lyons said her family has run into terrible times this year and started to cry when she was asked about it. There’s nothing like the promise of a turkey dinner with all the trimmings to make people wake up early. Some pedestrians showed up at 3:30 a.m., Brown said. About 4,000 Phoenix residents visited St. Mary’s Food Bank Alliance on Monday, and for them, the wait was a small price for a huge Thanksgiving feast they otherwise might not be able to provide. By the time the annual three-day distribution event ends at 11 a.m. Wednesday, more than 12,000 people will have filled their cupboards and refrigerators from the offerings at St. Mary’s Food Bank Alliance, located 2831 N. 31st Ave., Phoenix. “Everyone gets a turkey, a box of canned goods, a box of produce and a five-gallon bag of potatoes,” said Jerry Brown, St. Mary’s Food Bank Alliance Director of Media Relations. Watermelons, cantaloupes, heirloom tomatoes, eggs, stuffing and pies also were handed out. 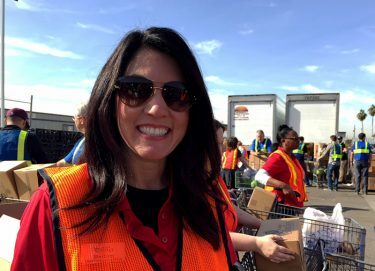 Lisa Notaro, Chief Development and Communications Officer of St. Mary’s Food Bank Alliance, was thrilled with all the giving by GCU employees, the baseball team and others. 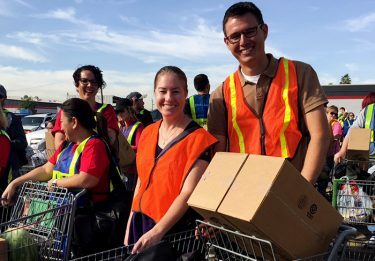 If it takes an army to feed the hungry, then St. Mary’s Food Bank is ground zero for more than 250 volunteers – including staff, faculty and students from Grand Canyon University. It takes leaders such as Mike Vaught, GCU’s Vice President of Athletics, and Dr. Sherman Elliott, Dean of the College of Humanities and Social Sciences. It takes colleagues such as CHSS directors Heidi Vogeny and Adam Eklund, program director Kathy Britton and Kerry Stream. Also helping were Assistant Athletics directors Renee Gonzalez and Mark Wilty, Deputy Athletics Director Jamie Boggs, Senior Associate Athletics Director Nick Ojea, and Jason Linders, Senior Associate Athletics Director for Student-Athlete Development. It takes people who want to make the world a better place one turkey at a time. Dr. Sherman Elliott (left), College of Humanities and Social Sciences Dean, and Jason Linders, Senior Associate Athletics Director for Student-Athlete Development, enjoy a morning of distributing turkeys. “There is a lot of gratitude here,” Linders said. 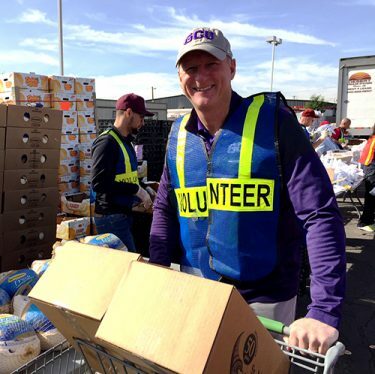 Thousands of turkeys and more than $20,000 in donations were collected on Super Saturday (Nov. 18), when groups such as the GCU baseball team fanned out to 28 Albertsons and Safeway stores across the Valley to encourage contributions. 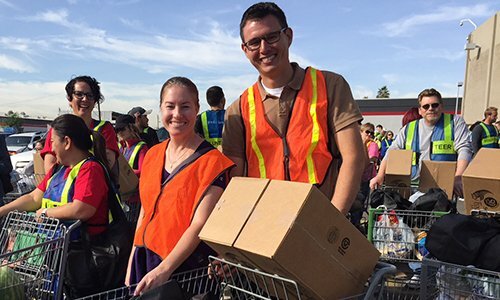 On Monday, volunteers in other strategic roles were dispatched across the property to unpack trucks, direct traffic, organize food items, push carts filled with groceries and unload them swiftly. For Chuck Bellew and Vernita, his wife of 47 years, St. Mary’s Food Bank fills a crucial gap. CHSS directors Heidi Vogeney (left) and Adam Eklund spent a busy morning distributing Thanksgiving dinners at St. Mary’s Food Bank Alliance. Now – With every $10 contributed, you earn a Turkey Ticket and St. Mary’s Food Bank can provide food for 70 meals. Pono Construction promised to match the first 350 donations from GCU. Donate here or by contacting Debbie Accomazzo, Leigh Crichtley or Jackie Smith on the main campus. If you work at 27th Avenue, contact Boyle, Vanessa Garcia (second-third floors), Haley Bliss, Ashley Nogales (third floor) or Mandy Edin (fourth floor). 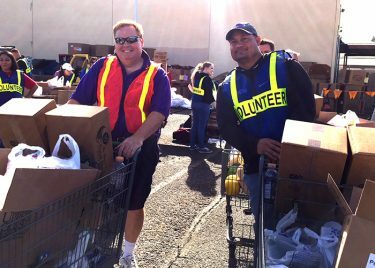 Through Wednesday – GCU employees can join other community supporters in distributing turkeys with all the trimmings at St. Mary’s Food Bank. To volunteer, email Accomazzo, Community Outreach Manager. Volunteer hours are HR approved for Community Service Time.